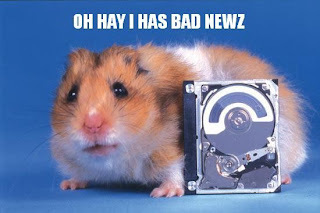 I chuckle when I read some people's online reviews about hard drives they just purchased, some of which who complain about all kinds of problems they had, and swear they will never buy [INSERT HARD DRIVE MANUFACTURER HERE] ever again. 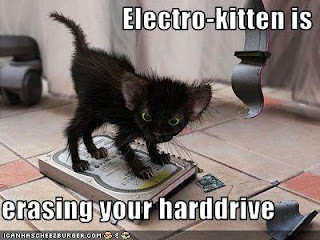 Firstly, some hard drives come with a 5-year warranty, which is rare in consumer electronics. You find this kind of warranty typically in loudspeaker systems and maybe in some very high end gear. There could be a number of causes of hard drive problems, for example, heat, like in DVR's, but failure usually occurs after years of service. What a lot of folks are not aware off is that external hard drives come pre-formatted out-of-the-box in a file system that may not be the most efficient to use with your particular computer, whether it is a Mac or PC. Some manufacturers even pre-install software on the hard drive, and come with software utilities that anti-virus/anti-spyware software may identify as malware. I know this from experience. You almost never need to install these utilities. The one exception to installing one is perhaps a backup and recovery utility, like Retrospect, if you are using the hard drive for that particular purpose. What I always advise folks to do after getting a brand new hard drive is to format it in the file system your computer's operating system uses. For example, NTFS for Windows XP and Vista, and Mac OS Extended for Mac's. As a result, you would wipe the hard drive clean by erasing all contents on it, and optimize the performance of the hard drive. For example, a lot of external hard drives come pre-formatted in FAT32 which does not utilize the disc space as efficiently as NTFS. So what do hard drives have to do with video services, you ask? Why would you want to do this instead of just transferring the videos to DVD or Blu-ray? For one thing, you can edit the home videos yourself (add titles, music, etc.) and produce your own DVD's, or share your videos on the Web, like on YouTube or Facebook, with family and friends. Windows Movie Maker and Apple iMovie are surprisingly robust for basic editing software, and they come free with Windows and Mac OS, respectively. Of course, Ted's Video Services specializes in professional video editing, but this level of service might be overkill for editing your home videos. Furthermore, you can enjoy first-hand the creative process that goes into video editing, and you can take all the time in the world to do it. Moreover, we use professional-quality video capture devices to digitize the videos for the best picture quality. Sometimes customers bring in old home movies they want to transfer--8mm, Super 8, 16mm--but don't know what's on them. We can transfer these home movies onto hard drives as well. But wait! There's more!!! . . .
Ted's Video Services can also edit videos transferred directly to DVD, cutting and trimming scenes from the original video. However, unlike our full, professional editing service, this DVD transfer editing does not allow for titles, transitions, adding music, special effects, etc.--only basic editing, as in cutting out bad scenes. For more information, please feel free to call us at (510) 796-2200 or (800) 221-1108 to inquire about which video transfer options would work best for you.